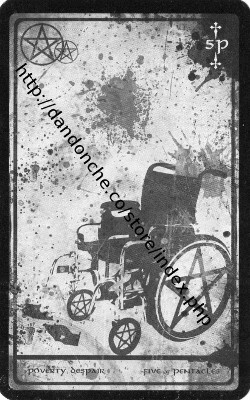 I intended this months cards would have messages for everyone who comes to read this blog or email. 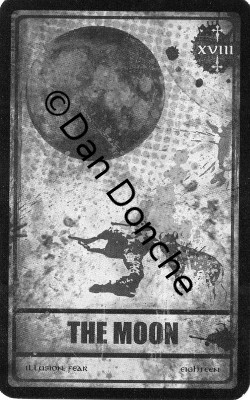 This month’s card reading for you all is The Moon from the Darkana deck. Immediately I am reminded of the following concept : When you are not ready to meet the forces of your universe, your gods, they will appear as demons and you will fear them. Once ready then these forces become our allies and our deepest drives. We fear the truth so often. The Moon helps us see in the dark, it tests our faith in ourselves in the absence of full knowledge and it helps us come to trust something deep within us so that when we are surrounded by darkness this inner light shows us the way we need to go. Thus the moon strengthens us and helps us be more independant and self-reliant in an emotional way. It also puts us in touch with our intuition and brings us events that help us trust it all the more. Ultimately it leads us to firm ground to stand on within ourselves that can not be shaken by external forces. This month we are presented opportunities to strengthen ourselves, our self-belief and our sense of inner security. It maybe that you have decisions to make but feel you have too little information, it maybe you are asked to make a decision and your instinct is to go against the grain and yet you have no ‘normally accepted’ justification for your position. This month you need to follow those instincts as something deeper in you is directing you forward. The affirmation from assertiveness training may help you with this at times. “I have the right not to justify myself.” Though in some work situation we might need to find a justification for a course of action in our own personal lives we need not justify our thoughts, actions and decisions to others. We can keep our power and just act as we feel is the best of our ability in the situation. As we do this it can help us move forward in ways we could not have predicted logically – we can find solutions to things that were unfathomable by reason alone. The moon casts light in the dark places in our lives too and sometimes for our intuition to be fully revealed we need to look into those dark places and admit to ourselves our deeper motivations sometimes come from parts of ourselves we would rather keep hidden from view. As we explore and come to love these parts of ourselves too so we become whole and even the darkest part of our nature also has a positive gift to give us as an loving awareness of our anger can bring us the ability to be assertive and stand up for ourselves against others who may be trying to bully or manipulate. So this month you may find information is hidden from you, that you can’t quite find out what you need to, that there are secrets and shadows, but as you go within and acknowledge your own shadowy places and personal secrets so you feel clearer and can then hear the voice of your intuition directing you on what action to take and the approach to maintain within yourself. How you judge another will help you have clues to how you judge yourself and give you access to parts of your shadow you may otherwise and not noticed. Taking the opportunty to connect with even the smallest part within you, expressed by those around you, will help you take charge of yourself and stand on solid ground whatever happens. So you may find the month ahead testing at times, however it is strengthening you and your own self-reliance in a positive way. Embrace all challenges as opportunities to strengthen yourself further. Trust your intuition and know that in the moonlight, whilst we can’t see our final destination we can see the next few steps to take quite clearly – keep walking forward and trust you will always know what the next step is.